Precious, lovely Rose is going through a rough time. She’s been tangled in a bad depression since Tamlorn died. There’s some days that are better than others, but the bad days are very hard right now. If could, I’d sweep her up and squeeze all the darkness out of her, the deep pain, the dread, the despair, the exhaustion and fear that maybe life will never feel better again. It’s wonderful that I’m in a good place right now, because both of us being in misery is very hard. But it has its own pain for her too, a fear of holding me back, a sense of failing. Complicated grief, with deep sense of brokenness. I can’t make it better, but I can make a space for her where she doesn’t need to hold up the sky or live up to expectations, or be worthy. Together, we can make our home a refuge. Yesterday was a bad day. I wanted to give her some token she could carry with her, through all the dark hours. 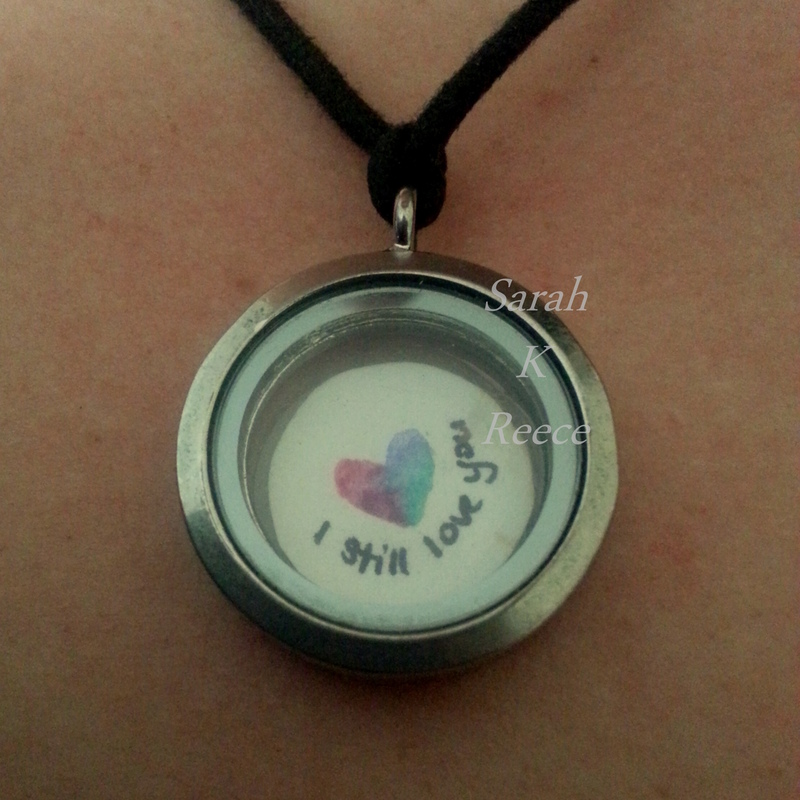 So I made this memory locket. I gave her one last year with little crystals in it to represent her family – her, and me, and 6 for the little babies who have died unborn. I broke it accidentally when trying to place a little charm in it that didn’t fit. So for her birthday this year, I replaced it with a new shiny one. I was going throw the old one away but her talk of brokenness made me see the possibilities in it. For those of you who aren’t familiar with memory lockets, they have a little window on both sides, giving them a front and reverse side. I used water colours and ink to create this little artwork, you can flip it back and forward in your hand to see each side. She loved it. She doesn’t have to believe it. It doesn’t take away the pain. But it’s something. There’s a kind of peace there.